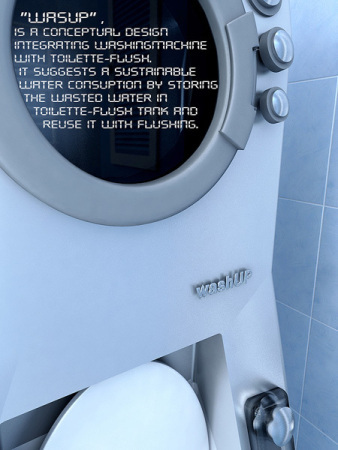 The Washup is a conceptual design for a toilet/washing machine combo to conserve water, save space, and provide a more ergonomic solution to typical washing machines interfaces. The Washup was designed by Sevin Coskun of Turkey, and it was a Notable Entry at the 2008 Greener Gadgets Design Competition. The toilet-washer duo is smartly designed with a large capacity water tank to store the washing machine's waste. Of course, you would not have to wash your clothes in order to flush the toilet, as there is a conventional pipe into the toilet tank as well. As well as conserving water, the Washup solves a space problem, for many homes and apartments, particularly outside of the U.S., do not have bathroom space for a washing machine, nor do they have laundry rooms. In addition there is an ergonomic consideration in having a front facing washing machine around eye level on a wall. You can see and reach items in the Washup without having to bend over. There are three separate control dials on the front of the machine for various machine settings, as well as two flushing buttons on either side of the Washup. 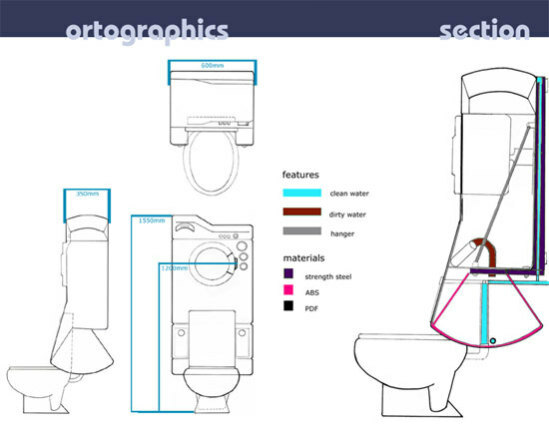 My colleagues, Steve and Myra, have both written about the Caroma Profile, a combination toilet and sink that was one of Popular Mechanic's Top 10 Brilliant Gadgets of 2008. The Caroma and the Washup are two ways to save water and space. And then there's the Vertical Bathroom! Looking forward to seeing what else will be hooked up to the toilet in the future! A Primer For The Newest Health Food Craze: Raw Chocolate! what if the top thing falls on you? What if the laundry falls in the toilet? (Some will probably forget to close the toiletlid while taking the laundry out). 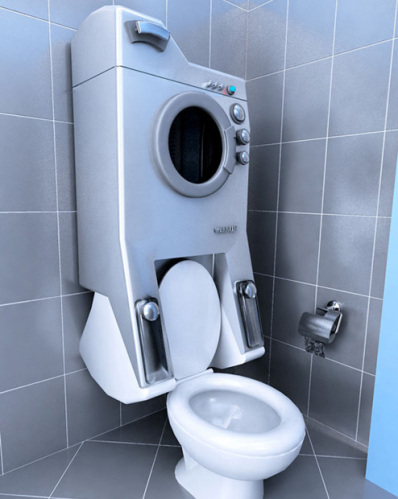 Would you really like the machine on while using the toilet? Wouldn't the toilet be in the way when you put the laundry in and taking the laundry out?